Wired Vs Wireless Speakers: Which Should You Choose? - Which? We explain the pros and cons of connecting up your speakers wirelessly or via a cable, and that many ‘wireless’ speakers allow you to do both. 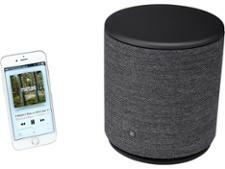 All separate speakers we test these days are ‘wireless' speakers, which means they can connect to your devices, such as your smartphone, wirelessly. If you’re used to connecting your speakers via a wire, or are looking to further your understanding of the best ways to connect up your speakers, we iron out the details. ‘Wireless' speakers can be a confusing term – it doesn’t mean the speaker has no wires at all. For example, all home wireless speakers will have a wire connecting the speaker to the mains for power, and most portable models currently need you to plug in a cable to charge them when their built-in rechargeable batteries are depleted. In addition, many wireless speakers contain a ‘line in’ socket, also known as aux in, which allows you to connect your wireless speaker to your audio source via a cable if you wish. This is particularly useful for connecting older non-wireless devices such as your old record player or CD player to your new wireless speaker. As a result, if you go for one of these models than have an aux in – common even in many budget wireless speakers – you don’t need to choose between buying a wired or wireless speaker – you will get one that can do both. 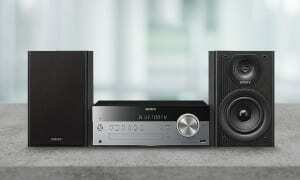 See which wireless models we recommend by heading straight to our Best Buy wireless speakers. 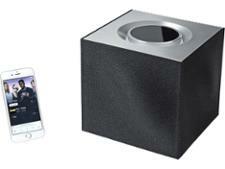 A wireless speaker simply means it has capability to connect to your devices wirelessly, not necessarily that this is the only way it can connect to your devices. So with many models, the choice of whether to connect wirelessly is up to you. Pros: No messy cables lying around, no working out which cable fits in each slot. You no longer take any noticeable hit to sound quality by connecting wirelessly with good wireless speakers. Cons: There may be rare wireless connection dropouts or interference in some areas, setting up the wireless connection is usually simple but requires learning when doing it for the first time (most speakers will automatically reconnect thereafter), wireless connections consume battery power on connected portable devices such as your smartphone. Do all wireless speakers connect in the same way? No. There are two main types of wireless technology, Bluetooth and wi-fi. This is a near-field communication technology that allows you to connect, or ‘pair’, two devices over a short distance – typically up to 10 metres apart, although it can be more. You will need to ensure your speaker is in Bluetooth pairing mode (often activated by holding down its Bluetooth pairing button), and then find and tap on the speaker in the Bluetooth settings menu in the settings on your smartphone or other devices to connect. Pros: Often easier to set up. Many modern devices support Bluetooth, you don’t need an internet connection or wi-fi signal. Cons: Not much. Sound quality can be excellent via Bluetooth, but for those looking for the very best sound, a wi-fi connection can be a touch better, although Bluetooth technology is now superb and continuing to improve rapidly, narrowing any remaining perceivable gap to wi-fi and wired connections as well. This is the same connection you use to connect your devices at home wirelessly to the internet, using an internet router or home hub. Unlike Bluetooth, there’s no limit to how close your speaker needs to be to the audio source, but both need to be connected to your wi-fi network. To connect to your speaker in this way, sometimes you will need to turn the speaker on and find it in the wi-fi settings menu on your smartphone or other device (similar to Bluetooth). Alternatively, setting up wi-fi is often done via your speaker’s dedicated app, which you install on your smartphone or other device. Pros: Sound can be a touch better (hence some home wireless speakers only support wi-fi). Connecting via wi-fi can give you more functionality, for example access to music streaming services such as Spotify (some requiring a subscription), support for voice assistants (such as Google Assistant on Android and Siri on Apple devices) to allow you to control your speaker with your voice alone, and a great deal of extra functions. Cons: Needs a wi-fi signal to work, so you can’t really use it while out and about (you could set up your smartphone as a wireless hotspot, but this will rapidly eat into your mobile subscription’s data allowance). 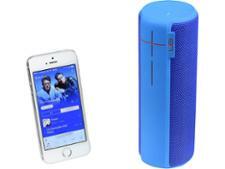 As a result, all portable wireless speakers will support Bluetooth. Not all wireless devices support wi-fi. Last but not least, NFC (or near-field communication) is a subset of Bluetooth connection that further simplifies connecting wirelessly. It means you don’t have to find the wireless speaker in the Bluetooth menu on your smartphone or other device. Instead you simply touch your smartphone or device against the NFC symbol on your NFC-supporting speaker to connect automatically. Not all Bluetooth speakers support NFC. 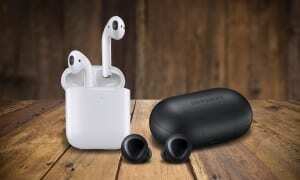 Similar technology is available on other products, such as wireless headphones and Bluetooth radios. Do all wireless speakers support Bluetooth and wi-fi? No. Some wireless speakers will support only Bluetooth, some only wi-fi, and some will support both. In practice, you will often find you don’t need both, although it can be nice to have the option. All portable models support Bluetooth. Some also support wi-fi, but the usefulness of wi-fi for portable speakers is limited as you need to be in range of a wi-fi signal. Many of these support both Bluetooth and wi-fi, although some will only support one or the other. If you have a choice, you should choose to connect via wi-fi as sound quality can be slightly better, although both can be excellent. 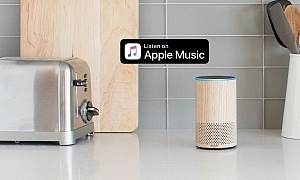 Note that smart speakers, which have voice assistants that allow you to control them with your voice alone, will always support wi-fi, as voice assistants require an internet connection to work. This also means that voice assistants in portable models will only work to their full functionality when in range of wi-fi. For more on smart speakers, see our smart speakers guide. Do you need to get new speakers to connect wirelessly if you already have wired speakers? No. If you already have a great set of wired speakers, or have a home sound system you thought would last decades only for it to now seem dated in the wireless and online music services age, there’s no need to fret. It’s been possible to create fantastic-sounding speakers for decades - ones that can sound just as good as many of our Best Buy speakers. Except at the very high end (audiophile and professional speakers), the aim of modern speakers has generally been to bring fantastic sound to smaller and easier-to-use devices and to improve convenience through new ways of accessing your music. So if you want to upgrade your current wired speakers to the digital age, all you need is a simple and cheap Bluetooth adaptor, which you can simply plug into your wired speakers to make them wireless. Then you’ll be able to connect your traditional speakers to Bluetooth-enabled devices such as your smartphone. You should expect to pay £20-30 for a Bluetooth audio adaptor. Much like expensive cables, you don’t get noticeably better sound by paying any more. Just note that some will also give you NFC support by letting you tap your NFC device onto the adaptor for an instant Bluetooth connection, which can make it even easier to connect to your devices. Examples include the TP-LINK HA100 HD Bluetooth Stereo Audio Music Receiver Adaptor with NFC Technology, Esinkin Bluetooth Audio Adaptor (NFC Enabled), Logitek Bluetooth Audio Adaptor and Mpow Bluetooth Receiver. Whatever option you choose, note the type of Bluetooth the converter promises, such as ‘Bluetooth 5.0’. The higher the Bluetooth number, the better. As a result, be sure to get an adaptor released relatively recently to make sure you take advantage of the improved sound of the latest Bluetooth standards. With the latest standards, the difference in quality between Bluetooth, wi-fi and wired connections can now be extremely difficult, if not impossible, to discern. What connection should you go for to get audio perfection? It used to be accepted knowledge that wired speaker connections offered better sound. This was because it was much easier to transmit large amounts of electrical audio data down a wire than it was to transmit it wirelessly. 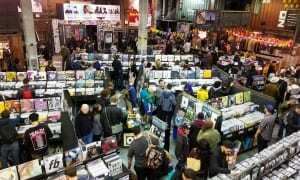 More data means higher sound fidelity – hence high fidelity, or wired ‘hi-fi’ systems, were born. However, unless you’re spending many hundreds of pounds on the most high-end audio systems money can buy (these speakers will be clearly marketed towards audiophiles or music industry professionals) and using very high-quality audio recordings, wireless technology effectively now matches wired connections in the vast majority of use scenarios. Any remaining gap has narrowed to the point where it has become extremely hard to notice the difference, even to trained ears. This is especially true of wi-fi connections, which can handle a vast amount of electrical audio data – in Which? reviews, this is why we test wireless speakers over wi-fi where possible, so we can score them on the best possible sound they can produce. However, the latest Bluetooth standards (such as Bluetooth 5.0 and above) can handle a vast amount of data now as well. In tandem with this, improved wireless speaker design has also greatly narrowed the gap to wired connections. We’re confident that, these days, even those looking for audiophile-friendly high-end speakers will find the sound produced over wireless connections acceptable. What is far more important for sound quality is the quality of the speakers themselves, so make sure you check out our wireless speaker reviews to make sure you get the best-sounding wireless speaker possible.